An introduction to the National Gallery of Canada's contemporary art collection, featuring works by Canadian and international artists from the 1970s to the present. Organized into 9 easy-to-use sections, this film provides personal insights into why artists create, and looks at the range of materials they use and the effects of photography and new technologies. This short documentary is a portrait of Frederick Varley, Canadian painter and member of the Group of Seven. In the film, Varley returns to his studio in Toronto after a sketching trip. The camera moves about the studio selecting examples of his canvases and watches him as he begins a new painting. This short documentary looks at the work of artist Arthur Lismer, a member of the Group of Seven, emphasizing his contribution to art education and to Canadian art. At the Montreal Art Centre we see how children learn the independence of creative self-expression in art. A documentary about the self-taught painter William Kurelek, told through his paintings. There are scenes of village life in the Ukraine and the early days of struggle on a prairie homestead and the growing comfort of family life. In Ontario, Kurelek paints the present life of Canada with the same pleasure he painted the old. This short film studies the works of one of Canada's greatest contemporary etchers - Newfoundland-born David Blackwood. The artist himself guides viewers through a step-by-step explanation of the etching process. Scenes of his hometown, examples of his own work and vivid tales of an old mariner recall the tragic seal hunts and a way of life that has now vanished. Set against a background of her paintings and the Yarmouth, Nova Scotia, landscapes they depict, this short documentary is a portrait of the life and work of one of Canada's foremost primitive painters, Maud Lewis. Emerging from her youth crippled with arthritis, Lewis escaped into her painting at the age of 30. She had never seen a work of art and had never attended an art class but her paintings captured the simple strength, beauty and happiness of the world she saw - a world without shadows. 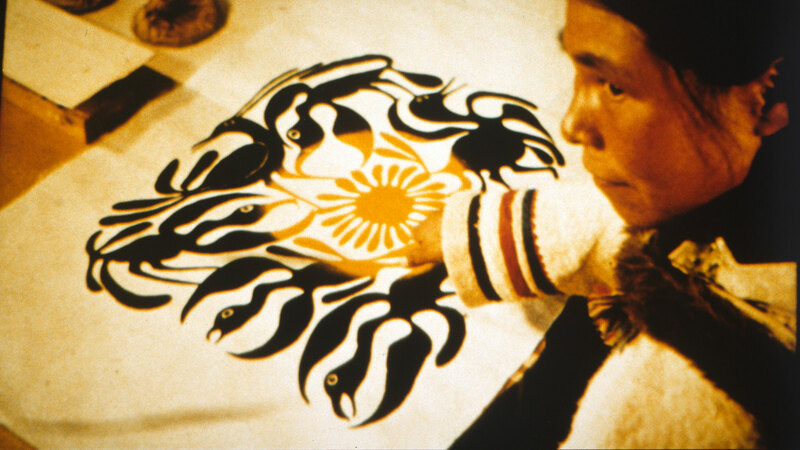 A doc about the Inuit art of Baffin Island. The film illustrates traditional leatherwork and carving, and the construction of a kayak.